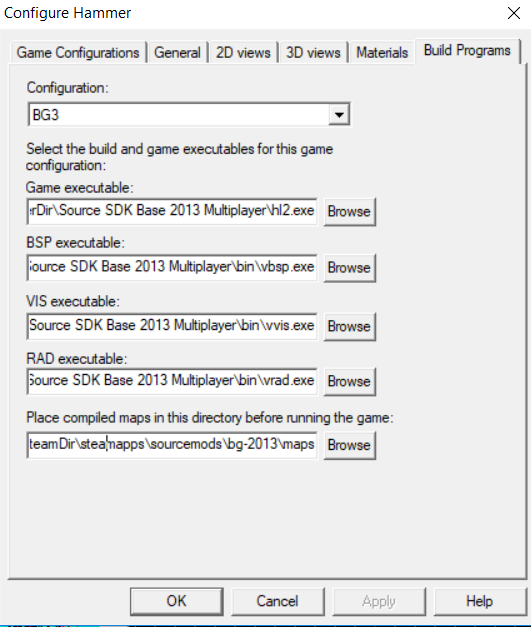 So, the Source SDK Base 2013 does not have an easy Source SDK tool like all the other engine versions do, which means that we'll have to link everything together on our own. This is not for the faint-hearted. I take it for granted that when I tell you to go to your Steam\SteamApps folder, you know what I'm talking about. Note that in my screenshots you will see bg-2013 instead of bg3 as the name of my folder. Don't worry, just imagine replacing bg-2013 with the name of your folder, bg3. Also note that on some systems steamapps may be capitalized to SteamApps. Make sure that you follow the pattern your system has. You won't be able to just copy-paste the paths I put here. 0. SVN Update if you haven't already and you're still in the beta. folder and choose hammer.exe . This will add the 2013 hammer to your Steam library for easy access. If you want, right-click on it, go to properties, and rename the shortcut to Source 2013 Hammer. 2. Open Source 2013 Hammer (the one you just added). You'll be asked to choose a CFG. This doesn't matter because we're gonna make a new one for BG3, so just click ok or next. If you don't get this message, don't worry about it. 3. With Hammer open, go to Tools->Options. This is where most of our work will be done. 4. For Game Configuration, click on Edit and Add a new one and name it BG3. Then close. 4.5 After making the configuration, make sure it's actually the one you have selected in the drop-down menu. 6. I'd recommend making your default entity types match what I have in the picture, but it's not necessary. 7. 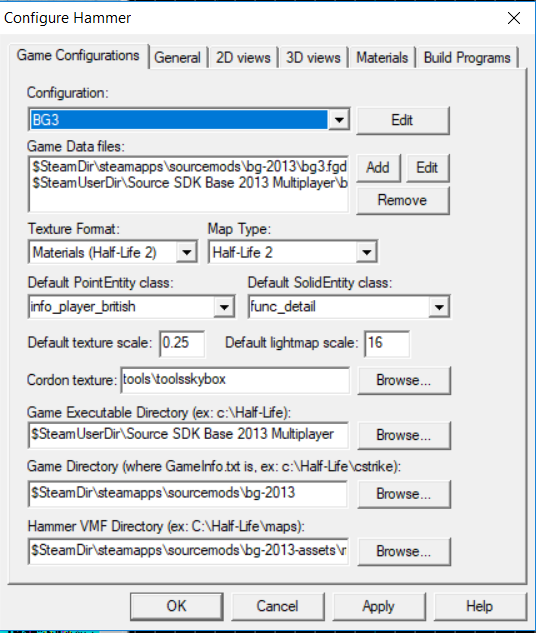 For the Game Executable directory, just use the SDK directory we've talked about. Look at the picture too. 8. For the Game Directory, point it at your BG3 folder. 10. Go to the build programs tab, as seen in the picture. Apply, restart hammer, check that you're using the right configuration from the options menu, and good luck! Decompiling old maps, replacing all missing models and textures, and doing it right is another topic for another day! I still want to make videos about all of this anyways. As the game is still in a volatile state, don't port or make maps and compile them with the final names you'd want them to have. Suffix them with _dev1 or _beta1 or the like.